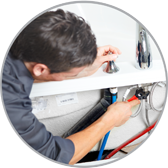 Plumbers face many challenges on a day to day basis, and many of those problems get avoided when the plumber’s customers know what they should not flush down the toilet. Clogged toilets and sewer tanks get stopped up by adult diapers, children’s disposable diapers, and feminine napkins. A trash can, placed by the commode and used to catch these items, would solve many of the problems that a plumber gets called to fix. Another common problem is things that get dropped into sinks like rings and other jewelry. The jewelry goes into the drain and gets trapped under the sink. A box used to put jewelry in while washing hands or dishes can alleviate the common mistake of jewelry in the pipes. Removing the J-pipe to recover jewelry is not hard for the plumber, but this entails a charge a plumbing call that can be avoided by the plumber’s patron. Dripping faucets, another common reason to call our Plumbing in Paradise Valley, AZ can be avoided or at least delayed by shutting the valve completely when turning the water off. Simply turn the faucet handle until the water stops running, but don’t put a lot of extra pressure on the handle because that might destroy the washer. Stopping leaky faucets saves money on the water bill, also. Another way to save money on plumbing if your pipes need replacing is what is called pex plumbing. Old steel pipes need replacing because of rust. Steel pipes in the 1940s were a cheaper way of plumbing than copper. Today, the steel pipes get replaced with pex piping as a cheaper way than copper piping. The pex tubing costs less than copper. The labor for pulling pex tubing is much less than that of soldering copper pipe. Ask our Plumbing in Paradise Valley, AZ to replace those old rusted steel pipes with pex plumbing.